"Traditional Quality Shoe Repair & Craftsmanship"
Jaguar Season Ticket Holders Receive 10% Off Repair Service! 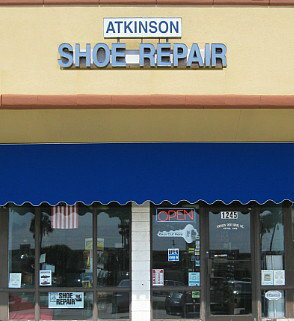 Atkinson Shoe Repair has been serving the Beaches Communities & greater Jacksonville since November 1969. January 2017 marks 20 years in their present location. Previously, located on North 3rd Street next to Dairy Queen for 27 years, relocating after a devastating 1996 shopping center fire. November 1st 2016 marked 47 years of Shoe Repair service in Jacksonville Beach, FL! Owner, Charlie Atkinson, is a Master Shoe Repair Craftsman (4th Generation). He has built Atkinson Shoe Repair to be well known and respected for their traditional quality craftsmanship, utilization of quality materials and unmatched friendly personalized service. All repair work is discussed, including cost of repair prior to work being done. They do their best to accomodate "your" schedule. By request, "While You Wait" service is also available for many types of repairs. Typically, drop off repair work can be picked up within a few days to a week. 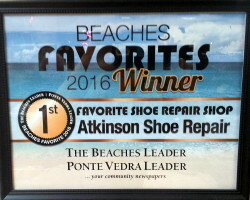 Atkinson Shoe Repair has been awarded "Beaches Favorite Shoe Repair" for consecutive years since the inception of the beaches community program many years ago. 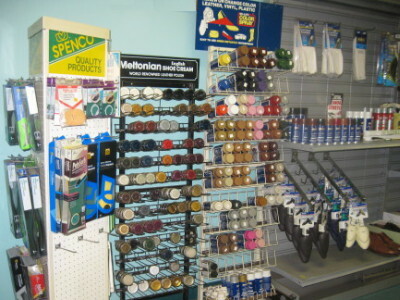 Atkinson Shoe Repair has earned the designation of Vibram and Birkenstock "Authorized Repair Shop". In addition, they are proud to be the exclusive repair shop for many retail stores including Carla Shoes & Accessories in Ponte Vedra Beach, Emily Benham and Rosenblums in South Jacksonville Beach, The Tailor Shop in Jacksonville, as well as, providing exclusive services for Oceanside Cleaners (Jacksonville/Ponte Vedra Beach) and Pampered Foot in St. Simons Island, GA. In an ever increasing population explosion in Jacksonville and it's Beaches communities, the demand for shoe repair is higher than it's ever been. The ability to help folks keep their favorites, give them absolutely the best repair possible at a fair price and save money is very rewarding. 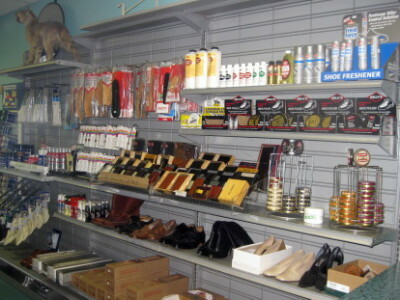 Stop in and see why Atkinson Shoe Repair is the people's choice for shoe repair! Don't live in the area? 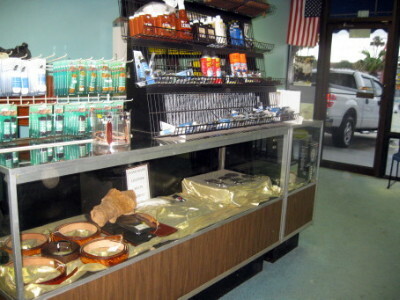 Repairs are available thru mail service, contact us for details. Atkinson Shoe Repair has proudly partnered with "Repair With Pink", a one-of-its-kind international charitable campaign to help win the fight against breast cancer in a way unlike any other. "Repair With Pink" is a line of bold pink heels and protective soles that are hand cut and custom-fit onto both women's and men's shoes, making a subtle but powerful statement that the war on breast cancer is still raging and we must continue to support the research until we find a cure. The pink heels and soles placed on your favorite shoes show your personal support in the fight against breast cancer. 10% of the proceeds from the sales of "Repair With Pink" will be donated directly to a local breast cancer foundation to support breast cancer research, patient care, education, and prevention. Atkinson Shoe Repair offers "Repair With Pink" year round in support of the fight against breast cancer. Stop in and tell us you want to "Repair With Pink"! We appreciate your business and look forward to taking care of your repair needs soon!